As Donald Trump spoke to a raucous, cheering crowd of supporters in New York after winning the U.S. presidential election, reactions in Asia to his unforeseen triumph ranged from sanguine to concerned. Accepting victory after the expected winner, Hillary Clinton, conceded defeat in a phone call to Trump, the Republican standard-bearer pledged again to put “America first,” echoing one of his campaign mantras. Among the first Asian leaders to congratulate Trump was Indian Prime Minister Narendra Modi, who prior to taking office, was — like Trump — accused of stirring domestic religious tensions. “We appreciate the friendship you have articulated towards India during your campaign. We look forward to working with you closely to take India-U.S. bilateral ties to a new height,” Modi said. How Trump deals with another loud-mouthed septuagenarian president, the Philippines’ Rodrigo Duterte, who has repeatedly insulted President Barack Obama since taking office in mid-2016, will be much anticipated. Speaking before the Filipino community in Malaysia, where he is on a state visit, Duterte congratulated Trump.”I don’t want to pick a fight because Trump is there,” Duterte said as he delivered his usual tirades against the U.S. “We’re the same. We both curse,” he said in jest. But with Manila forging closer relations with Beijing, it remains to be seen how the new U.S. president addresses a similarly combustible personality in the Philippines, a former U.S. colony and long-time ally. “Obama was very calm and rational in the face of Duterte’s comments [calling the U.S. president “a son of a whore”]. How will Trump react if Duterte says the same?” said Richard Heydarian, a Philippine political scientist. The new president will likely have work to do to assuage concerns in some of the other U.S. allies in Asia. “We just don’t know how a Trump presidency would be with regard to Asia, with regard to security issues such as the South China Sea,” Heydarian said, referring to the Republican president-elect’s perceived isolationism and threats to leave U.S. allies such as Japan and South Korea to fend for themselves. With the Republicans controlling not only the presidency but both houses of congress, Trump will be less constrained than most presidents when it comes to translating campaign rhetoric into policy. “A new president who has questioned decades-long alliances in Asia with [South] Korea and Japan, who has lashed out against China and who seems to have signaled to Putin’s Russia that he can cut a deal with them. America’s enemies, including North Korea, will be tempted to push the envelope, test how far they can go with the US,” said Manu Bhaskaran, chief executive officer of Centennial Asia Advisors, a Singapore consultancy. U.S. allies in Asia hope that Trump will be more restrained as president than he was when criss-crossing the vast American heartland on the campaign trail. “I draw an analogy between Mr. Trump and President Reagan. There were a lot of fears in the world too when [President Reagan was elected]. But he governed on the center, and approached competent people in The Republican Party to help him in his cabinet,” said Tommy Koh, former Singapore ambassador to the U.S. But it remains to be seen whether Trump emulates Reagan — another president elected to office in his seventies — by being more center-right in office than on the campaign trail. Despite a long career as a high profile businessman, Trump has railed against globalization and free trade — vitriol that struck a chord with millions of working class Americans. “America’s position in Asia is no longer concrete and the rest of the world has to focus on moving forward without America, such as going ahead with the Trans-Pacific Partnership without America,” said Simon Tay, chairman of the Singapore Institute for International Affairs. 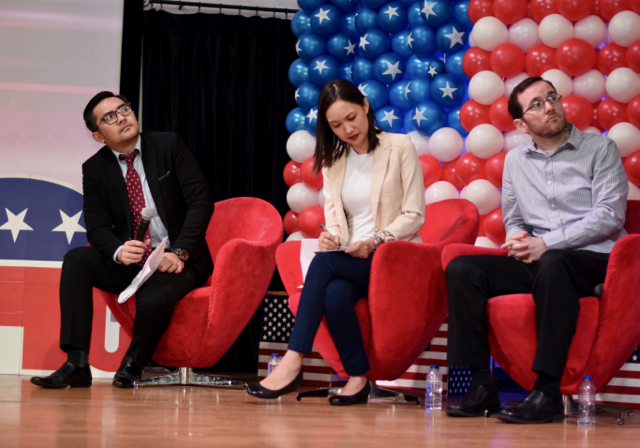 At an election results event staged by the U.S. embassy in Jakarta, Nadia Sofiandi, a local businesswoman who recently returned from the U.S., said that Trump’s wariness of free trade deals could benefit Indonesia, where economic nationalism has a long history. “We are not part of the TPP, so if Trump ditches that, it means that Indonesia would not lose out if it goes ahead and we’re not in,” she said. Although Sofiandi and her friend Jesen Kamadjaja dislike Trump’s anti-immigrant and racist rhetoric, they do not expect this to translate into policy when he takes office. “I think it’s stuff he says to win the election, he might have a different game plan when in office,” said Kamadjaja. Despite Trump’s anti-Muslim statements, the brash businessman nonetheless has his admirers in the world’s biggest Muslim country – a place where tycoons often move into politics. “Indonesians get entrepreneurs, they relate to Trump more than Clinton,” Kamadjaja continued. In Indonesia, a similarly blunt candidate, the former general Prabowo Subianto, came close to winning the presidency in 2014. Fadli Zon, a confidante of Prabowo’s who is deputy speaker of Indonesia’s parliament — and who caused controversy in Indonesia by visiting Trump in New York in 2015 — tweeted his congratulations to the winner soon after the election was called. But even if some people are not overly concerned by the new U.S. president, countries such as Malaysia, the Philippines and Thailand are edging toward an increasingly assertive China, another frequent target for Trump’s bellicose electioneering speeches. Despite being the latest Asian leader to move closer to China, Malaysian Prime Minister Najib Razak offered his congratulations within minutes of the president-elect’s victory speech. “Mr. Trump’s success shows that politicians should never take voters for granted. Opinion polls, and established political figures, all underestimated the strength of his support,” Najib said. Sounding a similar note, Singaporean Prime Minister Lee Hsien Loong posted a congratulatory comment on his Facebook page on Wednesday evening following Trump’s win. “At each stage he defied expectations, and his journey has ultimately taken him to the White House,” Lee said. But for countries such as Brunei, Japan, Malaysia, Singapore and Vietnam — among the 12 that have signed up to the TPP, Trump’s win means the likely scuttling of the agreement. And that in turn means putting a brave face on what would likely be a blow to economies hoping to export to the U.S.
“In case TPP deal collapses, Vietnam still has other free trade agreements with other big economies, including Japan, [South] Korea, Chile, the European Union, the Russian-led Eurasian Economic Union and AEC [Asian Economic Community]. The country will continue to focus on these agreements,” said the Vietnamese Deputy Prime Minister and Foreign Minister Pham Binh Minh, ahead of the election. How Trump manages the China-U.S.-Taiwan triangle is another issue that will be watched closely in Asia. Taiwanese President Tsai Ing-wen congratulated Donald Trump on his election, though earlier in the day she also hinted at possible uncertainties that the new Trump administration may bring. “We believe our relations with the United States will be a long-term and trusting relationship. Maybe there will be some uncertainties, but I believe we are capable of stabilizing bilateral ties and the overall Asia Pacific environment,” Tsai told party officials on Wednesday before the election result was out. Across the Taiwan Strait, the rancorous U.S. election was seized upon by Chinese state media as another example of the flaws of electoral democracy. While such propaganda may be easily dismissed, the image of a divided America will likely damage the global standing of the world’s biggest economy and military power. Richard Heydarian, speaking from New York, said that crowds gathering in Times Square were “astonished” at the election results, while TV coverage from the U.S. showed Clinton supporters in tears at multiple locations across the country. Asian markets, too, were shaken by the news slowly dripping through. “Risk assets are looking very weak across the board and this has pulled down Asian equities and currencies — the South Korean central bank was said to be intervening in the currency earlier today. Safe havens however, such as the yen have strengthened this morning. Any additional weakness in global markets will weigh on Asian assets over the coming days,” said Cedric Chehab, head of global strategy at BMI Research. After telling supporters in New York that Clinton had called him to concede, the divisive Republican victor struck a conciliatory note that could appease the skittish markets and assuage concerns about a divided superpower. With reporting by Nikkei staff writers Kiran Sharma in New Delhi, Rosemary Marandi in Mumbai, Cliff Venzon in Manila, Kim Dung Tong in Ho Chi Minh City, Debby Wu in Taipei, Mayuko Tani and Tomomi Kikuchi in Singapore.